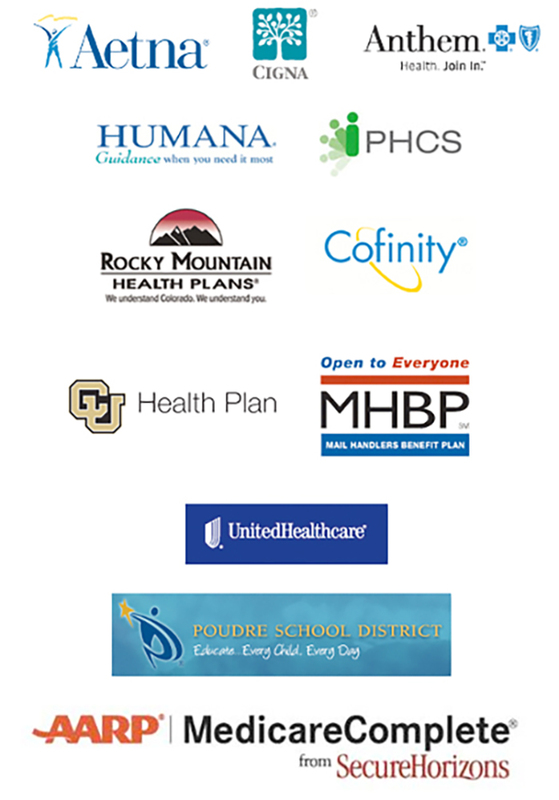 We are contracted with most commercial insurance including the following: United Health Care, Blue Cross/Blue Shield, Rocky Mountain HMO/Medicare, Aetna, CU Health Plan, Poudre School District, PHCS, Cigna, Humana, Mail Handlers, Cofinity, AARP/Medicare Complete/Secure Horizons. We always suggest reaching out to your insurance to verify that we are in-network with your plan. Your copay is due at the time of service. If you are uninsured, you will be expected to pay the full cost of your appointment at the time of service. Please ask us about our self-pay discount and payment plan options. Please let our office know if your insurance plan has changed as it is important to bill the correct insurance in a timely manner. If there are billing problems with your insurance company, please keep in touch with us. Ultimately, if your insurance does not pay you are responsible for the charges, as this is a contract between you and your insurance company. It is important that you know your insurance benefits and the providers of any specialty services; i.e. referrals, radiology, lab, home-care, etc. It is very difficult for our Fort Collins doctor's office to know which insurance uses which lab or x-ray facility.